Not so very long ago, LED Christmas lights were the new kids on the block. Traditional incandescent lights were the most popular type of Christmas lights, as they had been for many decades. But in just a few short years, that changed. LED lights became more and more popular. And now, because of the many unique benefits they offer, LED lights are the most popular type of Christmas light. So if you're going to be in the market for some Christmas lights this season, you'll need to choose between incandescents and LEDs. If you're like most consumers these days, you'll choose LEDs. 5 mm Wide Angle Conical: This is a very popular bulb. In fact, it's the #1 LED light used by pro Christmas lighting installers. The concave lens serves to maximize illumination far beyond that of traditional incandescent mini-lights. M5 LED Lights: The M5 is a combo of classic lens design and modern LED technology. M5s are not as intense as Wide Angle Conicals, but they offer a more even lighting that's equally visible from just about any angle. M5s are one of the better choices for interior light displays because their intensity is not bright enough to be distracting or annoying in an interior setting. C6 LED Lights: Also known as diamond-cut LED lights. A historically underused bulb that's rapidly growing in popularity because of the versatility it offers for both indoor and outdoor lighting. C6s are very popular for use in decorating Christmas trees. 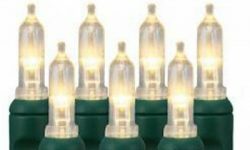 C7 LED Christmas Lights: C7s have long been one of the most popular bulb sizes. Their mid-range size makes them perfect for a wide variety of lighting designs. C9 LED Christmas Lights: This is the largest bulb size available in the traditional teardrop style. C9s are particularly popular in LEDs because they're so energy-efficient in spite of their large size. In case you didn't know, LED lights come in either half wave or full wave versions. What's the difference? It has to do with the speed of the flicker. All LED lights cycle on and off very rapidly. That's partly why they're so energy efficient. But they don't all cycle on/off at the same rates. Half wave lights cycle at about 60 times per second. Full wave lights cycle twice as fast at 120 times per second. Why should you care? You might not, but some people do. That's because the slower cycling of the half wave lights creates a flicker effect that is noticeable to some people. Not everyone notices it. But for those who do, the effect can be annoying and distracting. Some people even experience headaches as a result. But the flicker problem is non-existent with full wave lights. They cycle on/off far too fast for the human eye to detect. Half wave lights are generally less expensive than full wave lights. And that's why many people end up with half waves - whether they really want them or not. In fact, many people buy the cheaper sets without realizing what they're getting. But if you want to avoid encountering any of the potential problems of half waves, just buy full waves. And you can do that by simply purchasing your lights from our Pro Grade line, which are all full wave lights. Pro Grade lights offer some other advantages as well. One obvious choice you'll make when selecting Christmas lights is the colors you prefer. That's a pretty easy choice; after all, everyone knows what colors they want. But when it comes to selecting white Christmas lights, the decision becomes a little more complicated. That's because there's more than one version of white. Cool white lights are white with a little bit of blue mixed in. That's what gives them a 'cooler' look. Warm whites mix a little yellow in with the white, for a 'warmer' appearance. And if you want 'pure' white? Then buy pure whites. So before you begin your Christmas light shopping, decide which type of white will best fit your needs and preferences. If you'll be using C7 or C9 bulbs in your display, you'll have another decision to make. That's because you can buy lines for these two sizes as either stringer sets or empty socket lines. Here's the primary difference: Stringer sets come in preset lengths. Once you buy a stringer set, you cannot alter the length of the line. The alternative is to buy empty socket light line, and make your own custom-length lines. The stringer set is the easiest choice. But the empty socket lines are the best choice for a quality, professional-looking installation. But before you decide which will be best for you, you might want to spend some time learning more about the differences between stringer sets and empty socket lines. Decision #5: Buy Chinese-Made Lights? Actually, that's not a decision you get to make if you're going to buy LED Christmas lights. That's because Chinese-made lights are essentially the only lights on the market. Even so, there's still a decision to be made. That's because there's a vast difference in the quality of the lights made in China. We only sell great quality lights. We continuously confirm that by frequently visiting the factories in China that produce our lights. So you can be sure that any light you buy from us is the finest quality available. But if you buy your lights from someplace like a big box store, you can be sure of the absolute reverse. You can be certain that you're getting the cheapest lights made in China. That'll be a great feeling while you're in the checkout line. And that will be the last time those cheap lights give you a great feeling. There certainly are lots of decisions to be made when shopping for Christmas lights. But this guide will give you a good foundation for making the decisions that are right for you. And it could be worse. After all, what's worse than having lots of choices? Having too few choices. And you sure won't have that problem when you're shopping for Christmas lights!